Berlin - On Tuesday evening, the Bundesliga celebrated its 50th birthday with an atmospheric party. Almost the entirety of German footballing royalty was present in the Estrel Convention Centre in Berlin at the invitation of the DFL Deutsche Fußball-Liga and the DFB Deutscher Fußball-Bund. 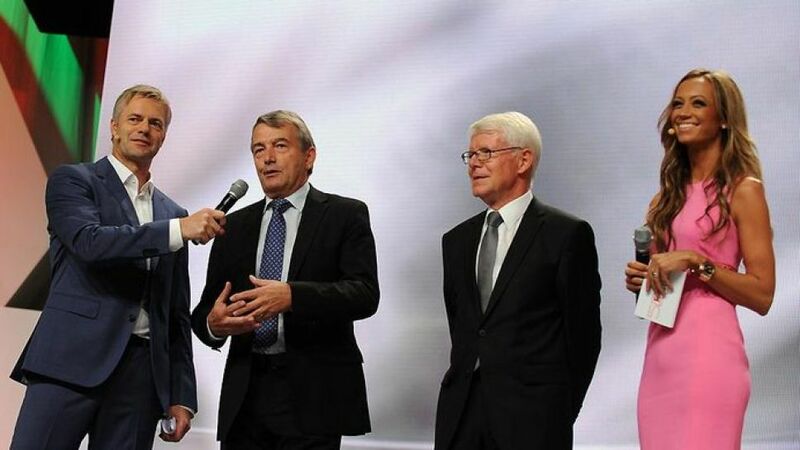 League Association President Dr. Reinhard Rauball and DFB President Wolfgang Niersbach welcomed the guests enthusiastically, praised the Bundesliga’s founding fathers and, along with presenters Kate Abdo and Tom Bartels, looked back on the league’s birth in 1963. The presenters took their honoured guests, made up of politicians, leading members of the clubs, and representatives from business and the media, on a journey through five decades of Bundesliga history. Emotions were awakened in all present during touching video sequences about the countless triumphs and dramas from Germany's top flight. Such moments ranged from bad haircuts to fashion faux-pas, as well as focusing on bizarre occurrences both on and off the pitch. The theology professor Dr. Wolfgang Huber was guest speaker and focused on the spirit of the beautiful game, its social responsibility and the example it must set to a wide community of people. One of the highlights of the ceremony was when honours were presented to three men who have left their mark on Bundesliga history in a special fashion. Karl-Heinz Körbel was honoured, who, with 602 matches is the Bundesliga’s record appearance holder, and a true Eintracht Frankfurt legend because of his loyalty. Former Borussia Mönchengladbach and FC Bayern Munich coaching stalwarts Udo Lattek and Jupp Heynckes were also recognized, and Heynckes, who lead Bayern to a historic treble last season and participated in more than 1000 games as player and coach, received the Bundesliga’s lifetime achievement award. The highest standard of football in Germany had plenty of well-wishers on Tuesday night. ”After fifty years of the Bundesliga, I sense that we are at its strongest point,” said national coach Joachim Löw, and praised in particular the infrastructure, the promotion of young talent and the style of football. Uwe Seeler sees the same thing. “The Bundesliga is booming,” said the Hamburger SV legend, but as a child of the first Bundesliga season he stressed that the league must not rest on its laurels, and keep up the good work to ensure more success. The Bundesliga fraternity will want to ensure that the same passion which has led to so much prosperity up to now is preserved, in order for this unique success story to continue.